I hate it when we argue. You get huffy and difficult, I call for delivery. Neither of us ends up happy. I said some things I didn't mean. I was upset and I was being rash. I wasn't thinking straight. I was hungry. I insinuated that you were uncooperative, and that was unkind. You've never been shy to express your preference for a coaxing hand over an impatient one, and I should have kept that in mind. It was cruel of me to mention your flabby midsection. (And please don't think that unintentional rhyme makes my sentiment any less sincere.) You were having an off day. I see that now. Grant me this, please - you were being somewhat, completely impossible to work with, no? We can each shoulder some of the blame I should think, don't you? Alright then, I'll settle to call it even. After your return performance the other night, I'm in a forgiving mood. That night you behaved beautifully; your character was beguiling, delicate. You were the ideal dinner guest. Your company was so delicious that our earlier spat was the furthest thing from my mind. I should start by saying that this is not the recipe that gave me such troubles last week. 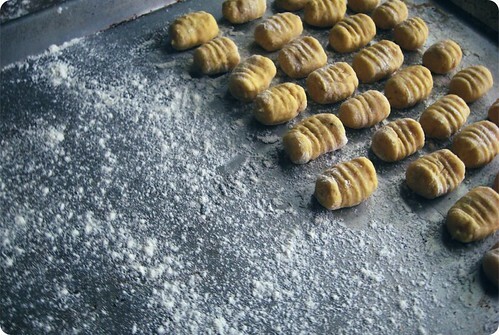 The gnocchi by Melissa Roberts by way of Gourmet are a treat, and the recipe together quickly enough as to reassure the harried cook of their competence. The combination of sweet potato and sprout is a new one to me, as I threw them together on a whim, but their shared earthiness makes them a match for the ages, with the sweetness of one subduing the slight bitterness of the other. Then we introduce some meaty walnuts for texture, a moment of crunch amongst the softness. Fine, salty threads of Parmesan round out the group, bringing along just enough nuttiness to repeat that same note found in its platemates. Fast friends, to be sure. In a large well-seasoned or nonstick skillet over medium heat, melt the butter into the olive oil. Cook until the butter begins to brown, around 1-2 minutes. Working quickly, add the Brussels sprouts to the pan, cut sides down. Let them sizzle just long enough to pick up some colour, then toss to coat with the butter and oil. Season with salt and pepper. Turn off the heat. Meanwhile, in a large pot of boiling salted water, cook the gnocchi for around 3 minutes, or from the moment they float to the surface wait a minute more. 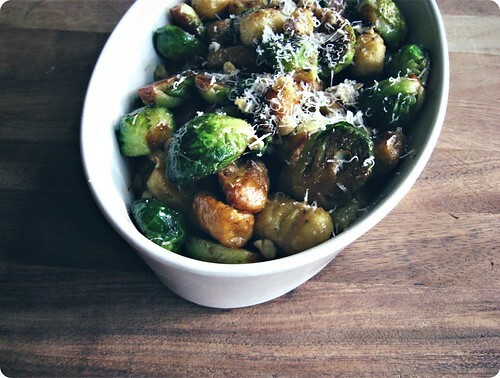 Using a slotted spoon, transfer the gnocchi to the still-warm skillet with the sprouts and half of the toasted walnuts. Gently fold to combine, then check again for seasoning. Remove to a serving dish, sprinkle with the reserved walnuts and top with Parmesan cheese. Serves 4 as a first course or 6 as a generous side. Note: The ever-charming Kelly, who has had her own dumpling issues in the past, was also beguiled by the Sweet Potato Gnocchi and wrote about it here. When Sean and I were considering menus for this weekend, I gave him the declaration of "I feel like something Labour Day-ish" as my input into the proceedings. I always try to be helpful. My description may have been cryptic, but it was the best that I could do. It is the last long weekend of summer, and no matter how we'd felt the week preceding, I wanted to take full advantage. I wanted summer sent on its merry way with every bit of its deserved fanfare. And so we're laden with corn to be husked, peaches for pies and tomatoes (from our garden!) for jam. We're thinking of burgers and coleslaw and drinks so cold that they send shivers down your spine. But even hours before a grill was lit, our celebrations were well underway. You see, my Monday through Friday breakfast is merrily unvaried. Lately, with the day starting cooler, I chat with the boys over a bowl of steel cut oats, drowned with extra milk, finished with a palmful each of granola, pepitas and blueberries. It's filling and simple, and I like it that way. However yesterday morning, instead of reaching for the oats I built towers of buttermilk pancakes. And then to begin today, we made something equally special. Clearly, I define Labour Day weekend not by barbecues, but by breakfasts. I am wary to christen these early meals brunch, for all its connotations of rubberized omelets and Hollandaise gone awry. But Saturday or Sunday breakfast, enjoyed with leisure, now there is a meal I can get enthusiastic about.Without the hustle to get everyone ready or out the door, we have the luxury of moving without haste. A long weekend's hours before noon, why, that's the time to revel inactivity. Before I continue, I know what you're thinking. "Hold up here. Your discourse is all well and good, but that photo looks like Brussels sprouts. For breakfast? And this is supposed to be festive?" I promise you, these sprouts feel fancy. And I'd be happy with them for breakfast, lunch and dinner. Elevenses and tea, too. These are not those grayed-out and useless Brussels sprouts, boiled within a moment of their lives and then left in their misery on cafeteria steam trays. These were shredded whisper-thin, jade and emerald strands wilted only barely by a warm slurry of bacon and sweet shallots. A slice of country bread charred in black tiger stripes by a grill pan, was tucked under the salad - but not before a smear of blue cheese had its opportunity to melt into its cragged surface. The crowning touch to the plate was a simple egg, fried in butter and with frizzled, brown tips, its yolk still soft and lazy. Broken open, the yellowness provided sauce for all, its fat the vehicle for the aromatic notes of the cheese and opposition to the twang of vinegar. Tomorrow morning is the last morning of the last long weekend of summer, and I'm planning my finale. I'm might even break out the water goblets. 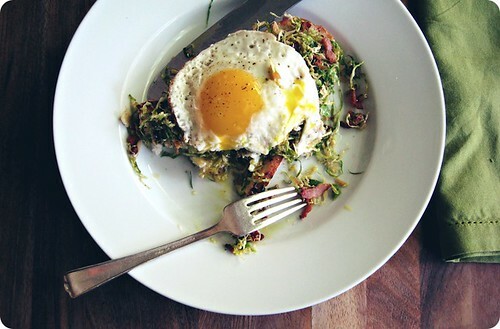 Once the Brussels sprouts are in the pan, the cooking should take only 2-3 minutes to prepare - at most. The sprouts are treated as a warm salad rather than a cooked vegetable; their raw edge is tempered, but their crunch should not be completely lost. Using a mandoline or the slicing blade of a food processor, slice the Brussels sprouts finely. Toss through with fingers to separate into strands. In a medium skillet over medium heat, fry the bacon until crisp - but not terminally so. You want crunch, but not bacon bits. Remove the bacon from the pan and drain on paper towels. Reserve around 1 tablespoon of bacon fat in the pan, discarding any excess. With the pan still on medium heat, sauté the shallots for 30 seconds or so, stirring constantly. You want them translucent, but not scorched. Add the prepared sprouts, tossing them through the shallots and bacon drippings. Season sparingly with salt and pepper. Once coated, it should only take a few seconds, deglaze the pan with the vinegar, scraping up any sticky brown bits from the bottom of the skillet. Continue tossing the sprouts until they are brightly coloured and barely cooked. Remove from the pan immediately, stir in the reserved bacon, and check for seasoning. Set aside. Meanwhile, toast the bread slices on a grill pan or toaster. Spread 1 tablespoon of Gorgonzola on each. Top with 1/4 of the Brussels sprouts. Top the salad with the eggs and serve immediately. • The sherry vinegar can be substituted with white balsamic. For those wary of blue cheeses, Gorgonzola is on the milder side of the spectrum. If you would like an even more subtle blue cheese, I would recommend Cambozola, a cross between a Camembert and Gorgozonla - it also sometimes known as Blue Brie. • If you prefer your Brussels sprouts softer, add a tablespoon or two of water (or chicken stock) to the pan with the vinegar to give them a quick steam. Keep stirring the vegetables until the additional liquid has evaporated.